3 things House of Cards taught me about character development. Pay attention, children. Hunt or be hunted. This pair scare me so good. If you’ve never seen House of Cards on Netflix, you are missing out on a treat. And you’re also missing out on some pretty big lessons on character development. Yes, character development. While this show is couch potato gold, it’s also writing gold. It’s not just the dialogue and the plot twists that really is worthy of its own posts but also of how the characters evolve, most especially the characters you love to hate. So, to make it easier for you, I’ve put together three writing rules I learned from my weekend watching of House of Cards. And yes, this contains no spoilers. 1.) The cause is just and everything is a means to an end. In the basic story structure, there is the protagonist and the antagonist, the good and the bad. This means that someone wants something and someone is in their way. 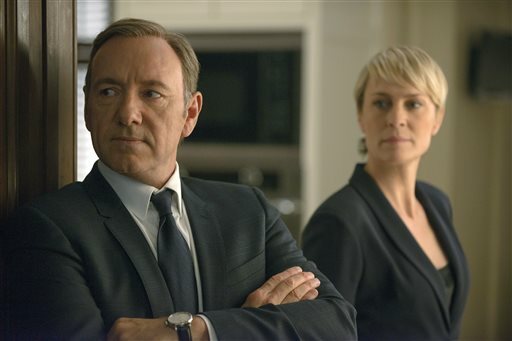 What’s interesting in House of Cards is that the characters want something always and what they want escalates. The means that your action and plot points have to escalate. Today, it may be power but tomorrow it’s position, or glory, etc. This keeps the plots moving. Characters all want something and what they do and how they do it, in their mind is justified, they are aiming toward their goal. If that means people die or are destroyed, then so be it. Frank and Claire Underwood, the main characters in this show, are the most despicable human beings on this planet. But somehow, I want to root for them, cheer them on in their blood thirsty quest. This is done because I, as a viewer, see pieces of humanity in them that reflect me or others I’ve known. I relate to them on a very basic level and so in my eyes they are redeemed. This is a fantastic technique if you’re writing characters who are less than nice, several degrees less than nice. Alright, despicable. If your lead characters are the scum of humanity, they are still human and that’s how a reader is going to relate to them. The reader doesn’t have to like them but they do have to empathize with them so that they can continue to be engaged. I’m not saying that sometimes bad people win (they do) but what I am saying is that those secondary characters who you love may become collateral damage. In fact, it works better when it is collateral damage. Depending on what you want to show, the destruction of a loved secondary character can be used to show what one of your other characters are willing to do for what they want or it could be used as a weapon, a way to hurt another character. I also like this as a way to clean house. If you’ve got too many characters, this technique can weed out them out. It can also open a door later in the story for the demise of another character. There you have it. Three quick character development rules I learned this weekend from House of Cards. Did you watch it? What things did you pick up on? Previous postWhat do the new 30s look like?